Herbie Kruger is a huge man with a huge intellect, and plenty of doggedness to pursue his quarry relentlessly. Outside of work, his Foreign Office coworkers know full-well of Herbie’s affinities for huge cocktails and blasting Mahler on his stereo. He’s back in London, following a long career running spy rings in the divided Cold War Germany. So when a Frau Fenderman accosts a Beefeater guarding the Tower of London, and strongly requests she be shown where her Nazi husband was executed in World War 2, it’s only natural the case winds in Big Herbie’s giant mitts. And what a case. Herbie’s investigation leads back to George Thomas, a Foreign Office old-timer. Herbie conducts several hours of interviews, and the story is shocking in its audacity. The Third Reich hierarchy was rife with occult believers. From ancient Teutonic myths, to astrology, to the prophecies of Nostradamus, these Nazi leaders searched the various mythologies, seeking prophetic assurance that Aryan Germany would emerge triumphant. Somebody in the Foreign Office had a brilliant idea: what if they could slip some fake prophecies into Nostradamus’s work? That was precisely George Thomas’s job back in 1941. Once Big Herbie begins debriefing George Thomas, the narrative alternates between the “present day”–1978 for this book–and 1940-41, when his amazing story takes place. George’s story is perfect spy novel fodder, with double-agents, safe-houses, secret weapons, and plots aplenty. Parts of George’s story, though, give Herbie pause. More and more, he begins to see how George’s WW2 actions relate to the widow in 1978 London. When the connections form and the truth becomes clear, Herbie finds himself with a powderkeg of a story that will shake-up foreign relations for countless nations, unless Herbie can stop the story dead. John E. Gardner has created a tremendous character in Big Herbie Kruger, and “The Nostradamus Traitor” does an excellent job debuting Herbie to the literary world. Rather than describe Herbie’s past in a giant introduction, we join Herbie in medias res, as he investigates the widow, her story, and her husband’s past. We learn what we need about Herbie as the novel moves along. As a result, “The Nostradamus Traitor” shows fine pacing. Like the investigator, we are eased into the story. As Herbie uncovers more detail–and as 1941-era George gets closer to executing his mission–the narrative speeds up. Once Herbie makes the connections, we’re fairly hurtling toward the end. 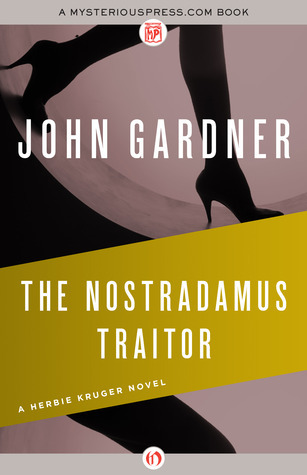 John E. Gardner originally published “The Nostradamus Traitor” in 1978. In this re-release, the details are left in 1978, so some things seem anachronistic (pay phones, reel-to-reel tape decks, East Germany). Gardner’s entire Herbie Kruger series has been republished in e-book form by MysteriousPress.com, who offer digitized versions of hundreds of out of print novels. Among them is “The Nostradamus Traitor.” In 1978, it served as an exciting start to the Herbie Kruger series. Now, in 2013, generations new and old can once again get to know Herbie. This entry was posted in Books, Mysteries/Thrillers, series and tagged booksandmoviesandcrap.com, Herbie Kruger, John Garfield, The Nostradamus Traitor. Bookmark the permalink.